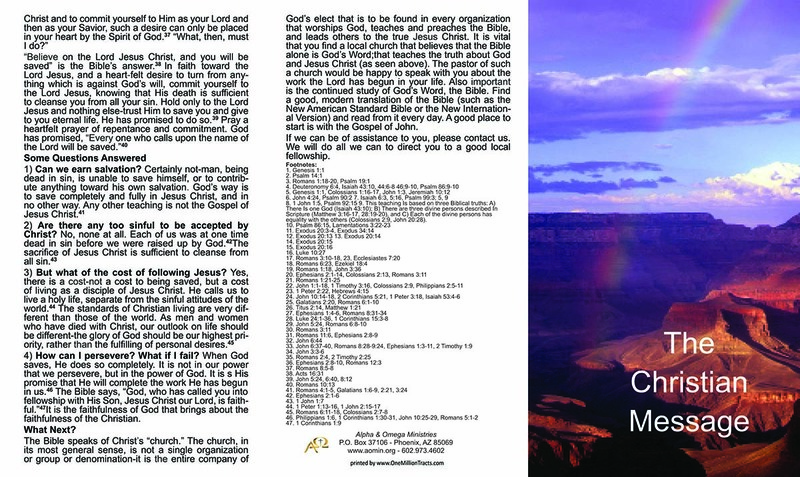 This tract was written by James White from Alpha & Omega Ministries (www.aomin.org). Comes in 25 count packages. The content of the Christian message is found in the book that Christians believe was given by God as a revelation of Himself-the Bible. The Bible tells us things about God that we could not know otherwise. What follows is based solely and completely on that book. The Bible’s message begins with God. 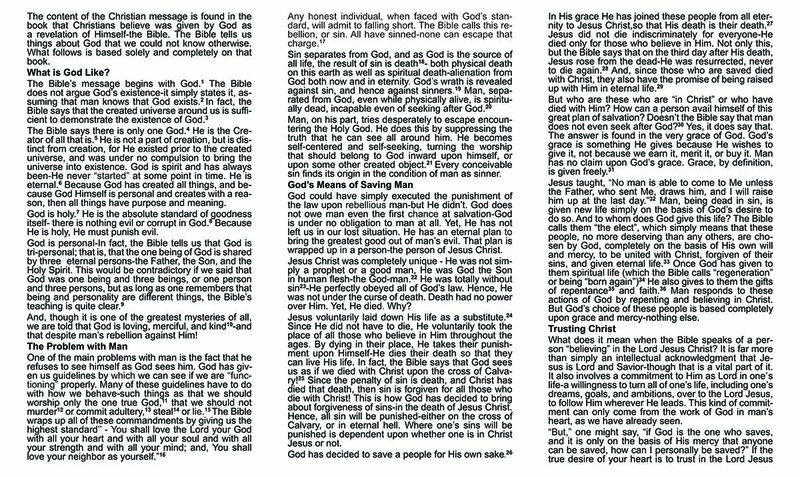 The Bible does not argue God’s existence-it simply states it, assuming that man knows that God exists. In fact, the Bible says that the created universe around us is sufficient to demonstrate the existence of God. The Bible says there is only one God. He is the Creator of all that is. He is not a part of creation, but is distinct from creation, for He existed prior to the created universe, and was under no compulsion to bring the universe into existence. God is spirit and has always been-He never “started” at some point in time. He is eternal. Because God has created all things, and because God Himself is personal and creates with a reason, then all things have purpose and meaning. God is holy. He is the absolute standard of goodness itself- there is nothing evil or corrupt in God. Because He is holy, He must punish evil. God is personal-In fact, the Bible tells us that God is tri-personal; that is, that the one being of God is shared by three· eternal persons-the Father, the Son, and the Holy Spirit. This would be contradictory if we said that God was one being and three beings, or one person and three persons, but as long as one remembers that being and personality are different things, the Bible’s teaching is quite clear. And, though it is one of the greatest mysteries of all, we are told that God is loving, merciful, and kind and that despite man’s rebellion against Him! Any honest individual, when faced with God’s standard, will admit to falling short. The Bible calls this rebellion, or sin. All have sinned-none can escape that charge. Sin separates from God, and as God is the source of all life, the result of sin is death - both physical death on this earth as well as spiritual death-alienation from God both now and in eternity. God’s wrath is revealed against sin, and hence against sinners. Man, separated from God, even while physically alive, is spiritually dead, incapable even of seeking after God. Man, on his part, tries desperately to escape encountering the Holy God. He does this by suppressing the truth that he can see all around him. He becomes self-centered and self-seeking, turning the worship that should belong to God inward upon himself, or upon some other created object. Every conceivable sin finds its origin in the condition of man as sinner. God could have simply executed the punishment of the law upon rebellious man-but He didn’t. God does not owe man even the first chance at salvation-God is under no obligation to man at all. Yet, He has not left us in our lost situation. He has an eternal plan to bring the greatest good out of man’s evil. That plan is wrapped up in a person-the person of Jesus Christ. Jesus Christ was completely unique - He was not simply a prophet or a good man, He was God the Son in human flesh-the God-man. He was totally without sin -He perfectly obeyed all of God’s law. Hence, He was not under the curse of death. Death had no power over Him. Yet, He died. Why? Jesus voluntarily laid down His life as a substitute. Since He did not have to die, He voluntarily took the place of all those who believe in Him throughout the ages. By dying in their place, He takes their punishment upon Himself-He dies their death so that they can live His life. In fact, the Bible says that God sees us as if we died with Christ upon the cross of Calvary! Since the penalty of sin is death, and Christ has died that death, then sin is forgiven for all those who die with Christ! This is how God has decided to bring about forgiveness of sins-in the death of Jesus Christ. Hence, all sin will be punished-either on the cross of Calvary, or in eternal hell. Where one’s sins will be punished is dependent upon whether one is in Christ Jesus or not. God has decided to save a people for His own sake. In His grace He has joined these people from all eternity to Jesus Christ,so that His death is their death. Jesus did not die indiscriminately for everyone-He died only for those who believe in Him. Not only this, but the Bible says that on the third day after His death, Jesus rose from the dead-He was resurrected, never to die again. And, since those who are saved died with Christ, they also have the promise of being raised up with Him in eternal life. But who are these who are “in Christ” or who have died with Him? How can a person avail himself of this great plan of salvation? Doesn’t the Bible say that man does not even seek after God? Yes, it does say that. The answer is found in the very grace of God. God’s grace is something He gives because He wishes to give it, not because we earn it, merit it, or buy it. Man has no claim upon God’s grace. Grace, by definition, is given freely. Jesus taught, “No man is able to come to Me unless the Father, who sent Me, draws him, and I will raise him up at the last day.” Man, being dead in sin, is given new life simply on the basis of God’s desire to do so. And to whom does God give this life? The Bible calls them “the elect”, which simply means that these people, no more deserving than any others, are chosen by God, completely on the basis of His own will and mercy, to be united with Christ, forgiven of their sins, and given eternal life. Once God has given to them spiritual life (which the Bible calls “regeneration” or being “born again”) He also gives to them the gifts of repentance and faith. Man responds to these actions of God by repenting and believing in Christ. But God’s choice of these people is based completely upon grace and mercy-nothing else. What does it mean when the Bible speaks of a person “believing” in the Lord Jesus Christ? It is far more than simply an intellectual acknowledgment that Jesus is Lord and Savior-though that is a vital part of it. It also involves a commitment to Him as Lord in one’s life-a willingness to turn all of one’s life, including one’s dreams, goals, and ambitions, over to the Lord Jesus, to follow Him wherever He leads. This kind of commitment can only come from the work of God in man’s heart, as we have already seen. 1) Can we earn salvation? Certainly not-man, being dead in sin, is unable to save himself, or to contribute anything toward his own salvation. God’s way is to save completely and fully in Jesus Christ, and in no other way. Any other teaching is not the Gospel of Jesus Christ. 2) Are there any too sinful to be accepted by Christ? No, none at all. Each of us was at one time dead in sin before we were raised up by God. The sacrifice of Jesus Christ is sufficient to cleanse from all sin. 3) But what of the cost of following Jesus? Yes, there is a cost-not a cost to being saved, but a cost of living as a disciple of Jesus Christ. He calls us to live a holy life, separate from the sinful attitudes of the world. The standards of Christian living are very different than those of the world. As men and women who have died with Christ, our outlook on life should be different-the glory of God should be our highest priority, rather than the fulfilling of personal desires. 4) How can I persevere? What if I fail? When God saves, He does so completely. It is not in our power that we persevere, but in the power of God. It is His promise that He will complete the work He has begun in us. The Bible says, “God, who has called you into fellowship with His Son, Jesus Christ our Lord, is faithful.” It is the faithfulness of God that brings about the faithfulness of the Christian. The Bible speaks of Christ’s “church.” The church, in its most general sense, is not a single organization or group or denomination-it is the entire company of God’s elect that is to be found in every organization that worships God, teaches and preaches the Bible, and leads others to the true Jesus Christ. It is vital that you find a local church that believes that the Bible alone is God’s Word;that teaches the truth about God and Jesus Christ (as seen above). The pastor of such a church would be happy to speak with you about the work the Lord has begun in your life. Also important is the continued study of God’s Word, the Bible. Find a good, modern translation of the Bible (such as the New American Standard Bible or the New International Version) and read from it every day. A good place to start is with the Gospel of John. If we can be of assistance to you, please contact us. We will do all we can to direct you to a good local fellowship. 9. This teaching Is based on three Biblical truths: A) There Is one God (Isaiah 43:10); B) There are three divine persons described In Scripture (Matthew 3:16-17, 28:19-20), and C) Each of the divine persons has equality with the others (Colossians 2:9, John 20:28).